Note: This blog was authored by our dear friend, Jan Phillips, who is a writer, musician and photographer who connects the dots between creativity, spirituality, and social action. She has taught in 23 countries, written 10 award-winning books, created three CDs of original music and developed a Youtube channel of videos. Jan is the founder and executive director of the Livingkindness Foundation, which built the Livingkindness Centre for Learning in Ikuzeh, Nigeria. The Blessed Sacrament Chapel at Saint Mary-of-the-Woods. I recently led a retreat at the Sisters of Providence campus near Terre Haute, Indiana. Turns out its founder is a canonized saint, Saint Theodora. The road there had been renamed the Saint Mother Theodore Guerin Memorial Highway. Despite a betrayal by the bishop, impossible living conditions and failing health, she founded a girl’s school, built a Novitiate, established two orphanages, two free pharmacies and several parish schools in Indiana and Illinois within 10 years. She died at age 57. On the day before my retreat, I walked the grounds for a couple of hours. I came upon an organic farm and farm store, an alpaca herd, a group of equine studies students on horses, a center for eco-justice, a community health center, beehives, classified forests and classes taking place in fiber arts, animal husbandry, organic gardening and cooking. I met the director of the equine program when I walked into the stable. I asked her if they used the horses in any leadership programs. “We use them with all kinds of groups,” she said. “They’re so intuitive and tuned in. One kid came into the ring and a horse picked up on him as a bully. You don’t know how they know, but they know,” she said. 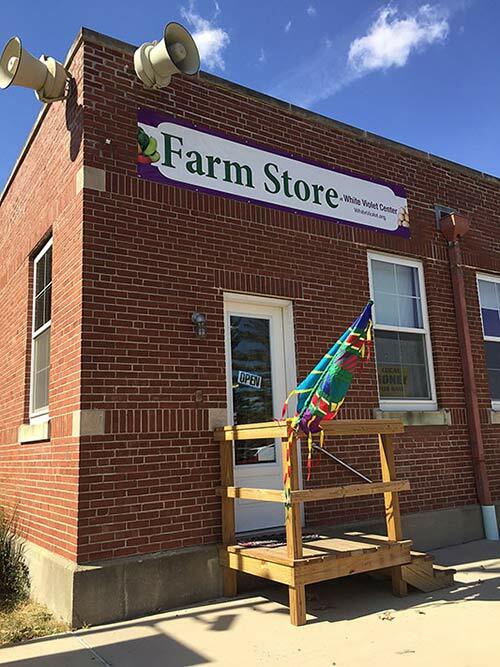 The Farm Store at White Violet Center for Eco-Justice. “This horse singled the kid out, cornered him against the fence and scared him till he started crying. Then the instructor came over and let the child know that that’s how other kids feel when he bullies them. They never had another problem with that kid bullying after that.” She cried as she told that story and I grabbed for my handkerchief as I listened. I wondered what Sister Theodore would think about all this change. After passing the alpaca herd, I came across a classroom where locals were learning how to spin yarn from their fleece. Minutes later, I was in the bookstore buying alpaca socks for the crisp autumn nights. When I returned to the Spiritual Center, I was given a tour through Saint Theodora’s shrine, past a diorama of her life and work, into the Blessed Sacrament Chapel where a sister was keeping watch in front of an 8,000 pound altar carved out of one flawless piece of Carrara marble. While she was speaking, I listened from a parallel universe. Fifty people were making their way from Illinois, Florida, Ohio, Michigan and Kentucky for my retreat. All I could see at the moment was how much they had. I had spent hours walking the land and I didn’t even get to the labyrinth, the nature walk, the lake, the hermitages, the wedding reception hall, the old Novitiate. Abundance was all I saw, all I felt. Vitality was in the air as bees buzzed, trees rustled, horses whinnied, alpacas hummed. I was in the Mecca of the Midwest, spiritually and physically. There was a shrine, relics, a memorial highway, a lake and forests, pathways for a healing walk in every direction. Signs of evolution were everywhere. Some things had died. Other things had resurrected. Life was heaving and breathing its way forward. Just as Teilhard de Chardin said. Matter transforming into the Divine, the Divine penetrating and divinizing matter. Consciousness evolving, complexifying. All of us undergoing our own spiritualization, right before our eyes. She saw lack and not enough. I saw abundance and everything we needed. Is it true that where we stand determines what we see? 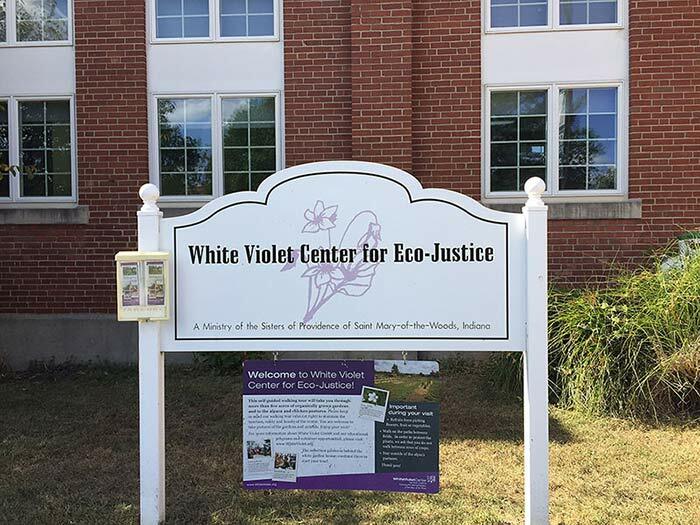 White Violet Center for Eco-Justice. I have worked with religious communities from Alberta to Newfoundland, Seattle to St. Louis, Maine to New Mexico. The tidal wave of change facing these sisters surges with emotions I feel in my own cells. Loss, bewilderment, grief, resolve, courage, hope. We all feel them, but at different times. Though I was sent home from a religious community in the late 1960s — too independent, not obedient, no religious disposition — I have remained a servant of unity, committed to being a light in the world. I have left the Church, as have so many others, to remain in integrity, join with the abandoned, stand for justice that knows no bounds. I understand the immensity of the questions facing each congregation as the living prepare for the death of an era. I understand the holding back, the cautious calls, the fear and anxiety about diminishing portfolios. And at the same time, I vote for extravagance. I vote for fireworks, celebrations, storytelling. I vote for evolutionary leadership. I want movies to be made of those heroes wheeling their way down long, lonely halls. I want those huge chapels turned into concert halls, stages, platforms for the mystics, artists, and prophets in our midst today. The caterpillar may be dying but something more beautiful, something ebullient is coming to life. The millennials are gathering and trying to make sense of the mystic mission. People of color are calling for justice, looking for partners in a paradigm shift. There is an exodus community of former Catholics, faithful to Spirit, looking for collaborators in a faith-making experience. Nuns are no longer needed in schools and hospitals, but those who have energy left can join this evolution of faith, can lead the way, call the circles, initiate the conversations about modern day mysticism and contemporary prophets. What is there to lose anymore? What is there to defend? Why have millions in the bank when the last door is closed? I have made pilgrimages to Benares, the Himalayas, Kyoto, Thailand. I have sought out holy places all my life, and last weekend I found one right where I was. The trees, the lake, the forests, the creatures — all sacred. The shrine, the relics, the monuments, the chapel — all sacred. And I have found this to be true of all the Motherhouses I have worked in over the years. 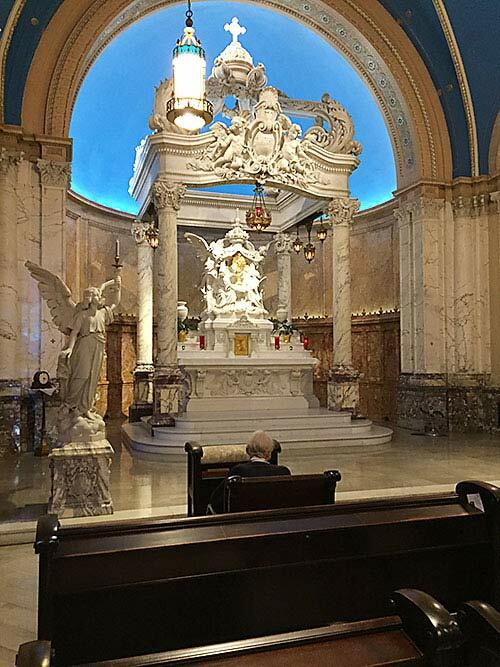 When I walk into the chapel at my former Motherhouse in Latham, NY, I breathe in the efforts, the prayers, the love of every sister who ever sat there. They have not left us. They are in the air we breathe, as are all the masters and the Source Itself. I suspect they are rooting for our bravery. Rooting for us to find in this turbulence an uplift, a place to soar, though all appearances are against it. Your reflections fill me with so much energy and hope, Jan. We have been as a Congregation working on seeing from a vision of the abundance of which you speak so eloquently. It is evident that you are allowing the Holy to reveal the Divine in all. Thank you for renewing my spirit and I’m certain that of countless others. I enjoyed the article as well, Sr. Paula. Came across this article on Facebook that a friend had shared and realized, I know her! Hi to Aunt June. Thank you, Jan, for your beautiful reflection on the retreat you lead at St. Mary of the Woods. I was at that retreat and loved it. It renewed my spirit! What a beautiful reflection, Jan! As a new Providence Associate, I share your wonder at the beauty and abundance at St. Mary of the Woods. It may be a hidden gem, but God continues to coax people from all walks of life to find this gem and to share in the works of the Sisters. God bless you in your work!